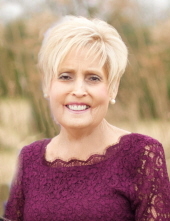 Sherry Lanier Kicklighter, 63, was called to join her beloved son, Justin, on January 5th, 2019 at her home in Glennville. Sherry came into the world on August 9th, 1955, Sherry Lanier, born to parents Sam and Olive. At 15, Sherry was diagnosed with scleroderma, an illness that became more debilitating over time, but her desire to care for her loved ones and share her life with others allowed her to overcome this disease with a much longer life expectancy than its average 20 years. Shortly after graduating Pinewood Christian Academy in 1973, Sherry married her beloved husband of 42 years, Danny Hugh Kicklighter. They shared two children, Justin Hugh Kicklighter, previously deceased, and Michelle Miller. Sherry delighted in her children and fur babies, Gabby and Lexi, and found joy even more abundantly in her grandchildren, Gage Kicklighter, Chi and Lanier Sittle, and Landyn and Jalyn Miller. Sherry had an active social life giving of herself to others whenever she could. She was a member of Harmony United Methodist Church, Tattnall Shrine Ladies Auxiliary, Garden Club, and Theta Zeta sorority. Her thoughtfulness and desire to take care of everyone are best remembered by family and friends; some even call her a “perfectionist” in these efforts. She enjoyed gardening, cooking, fishing with her grandchildren and spending time with her only sister, Sandra Burgess. The two of them took the trip of a lifetime recently to Las Vegas where Sherry treated her to a coveted Celine Dion concert. She is survived by her husband, Danny Hugh Kicklighter of Glennville; daughter and son-in-law, Michelle and Lance Miller of Glennville; sister and brother-in-law, Sandra and Dwight Burgess of Sugar Hill, Georgia; mother-in-law, Nell Tatum; brothers-in-law and sisters-in-law, Gene and Karen Tatum of Glennville, Paul and Martha Tatum of Glennville, and Jennifer and Todd Bridges of Statesboro; grandchildren, Gage Kicklighter, Chi and Lanier Sittle, and Landyn and Jalyn Miller. Numerous Nieces and Nephews also survive. Predeceased family members include her parents, Sam and Olive Lanier; her son, Justin; and her father-in-law, Tiny Tatum. Her physical presence will be missed, but her spirit will live on within the family and friends who will remember her selfless, devoted love and share it with others in her memory. Visitation will begin at 5:00 pm, Monday, January 7, 2019 at Brannen-Kennedy Funeral Home. Funeral Services will be held 2:00 pm, Tuesday, January 8, 2019 at Harmony United Methodist Church with Rev. Ramon Hernandez officiating. Burial will follow in the Harmony United Methodist Church Cemetery. To send flowers or a remembrance gift to the family of Sherry Lanier Kicklighter, please visit our Tribute Store. "Email Address" would like to share the life celebration of Sherry Lanier Kicklighter. Click on the "link" to go to share a favorite memory or leave a condolence message for the family.